British brand Atkinsons has launched three new fragrances in the brand's Contemporary Collection: The Big Bad Cedar, My Fair Lily and Scilly Neroli. The Big Bad Cedar (shown) ~ "A brooding, enigmatic Heathcliffean fragrance, The Big Bad Cedar is a sublimely stormy interpretation of the Scottish Highlands and savage Virginian cedar. Imagine turbulent skies and craggy mountains. Smoky peat fires, the cold, mineral water of the lochs, and the half-light of dusk is the setting for this scarcely cultivated cedar scent – an alliance of earth, wood and fire, preserved for all eternity." Additional notes include cardamom, clary sage, broom, moss and cashmeran. My Fair Lily ~ "Like the charmingly waifish Eliza Doolittle, who blooms into a deliciously aristocratic young belle in My Fair Lady, lily is a perfumery classic that has been gilded into a divinely shimmering cloud of a fragrance. Professor Higgins could not have concocted anything more natural and naïve, yet devilishly seductive and elegant than My Fair Lily. As radiant and fair as Eliza, this floral nuage draws on a Casablanca lily brightened with wild chamomile and rhubarb, and sensually deepened with patchouli and vetiver. My Fair Lily is a most disarmingly untamed lily, pirouetting between mischievous innocence and aristocratic grace." Additional notes include summer rain accord. Scilly Neroli ~ "South meets North in this sea-drenched, sunlit floral fragrance of Tunisian Neroli essence. It is a resolutely Mediterranean fragrance transplanted most beguilingly to the Scilly Isles of the North Atlantic, a lush, misty archipelago, warmed by the currents and breezes of the Gulf Stream. Stupendously solar, optimistic and bracing, this citrus fragrance is tempered by the mineral mists and crashing sea-spray of Albion. A fragrance of dazzling contrast that is both tropical and temperate." With lemon, petitgrain, Atlantic spume accord, neroli, orange blossom, ambergris and patchouli. 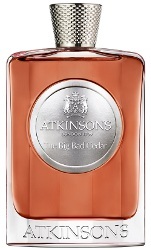 Atkinsons The Big Bad Cedar, My Fair Lily and Scilly Neroli are available in 100 ml Eau de Parfum. These sound fine and all, but I’m MOST excited about the imaginary vacation to Scilly I’m about to go on. The Cedar one sounds great. I always wonder how this line is? I have never tried one of their fragrances. I have tried only a couple, and they were fine but did not inspire me to buy and I’m afraid I don’t remember now which they were. So I’m no help! But agree the cedar sounds really appealing.